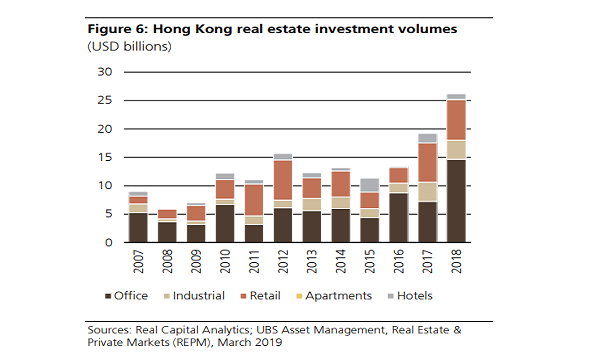 Massive inflows into the office sector in 2018 single-handedly lifted investment volumes into Hong Kong's commercial real estate sector by about 40% YoY to a record $204.09b (US$26b), according to UBS Asset Management’s 2019 real estate outlook. Investment volumes into industrial real estate appeared to be flat, whilst retail property only saw a slight increase in transaction volumes. Office transactions doubled to about $115.39b (US$14.7b) in 2018, bolstered by several large deals such as the $53.38b (US$6.8b) partial stake sale of The Center. “There was a discernible tapering off of investment flows in H2 2018, and given already rich pricing and more muted sentiment, investment volumes in 2019 are expected to moderate from the record high levels in 2018,” the report’s authors Adeline Chan and Shaowei Toh said. 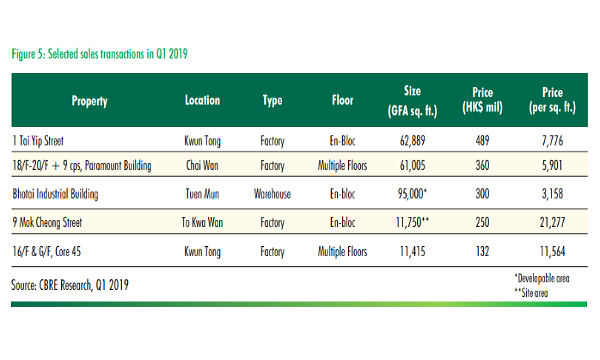 Net absorption in the overall Hong Kong office market reached an eight-year high of three million sqft in 2018, whilst leasing activity in turned sluggish amidst external uncertainties such as capital controls on the Mainland and a weaker Chinese currency. This in turn affected occupier demand from Chinese companies, which is likely to remain a factor in corporate real estate decisions in 2019 given that there are no signs of capital controls letting up, the report noted. Trade conflict and economic uncertainty are also likely to dampen sentiment amongst occupiers. 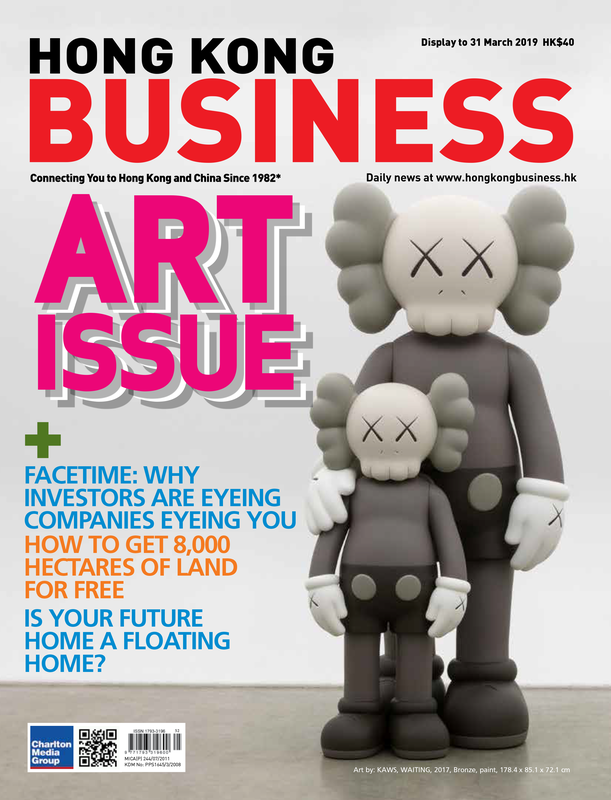 “What does work in the office market's favor is the low vacancy rate, as rents in Central and overall Hong Kong Island hit record highs in 2018 as vacancy rates continued to compress to all-time lows, supporting rents,” Chan and Toh explained, noting that even in the decentralized market of Kowloon, vacancy rates have trended downwards despite high supply volumes. The theme of decentralisation continues to play out in Hong Kong, whether it is occupiers making a lateral shift from the prime Central area to the less congested sub-markets of Causeway Bay and Island East, especially with infrastructure improvements such as the opening of the Central-Wan Chai Bypass, or occupiers moving off Hong Kong Island altogether into Kowloon, the report highlighted. Chan and Toh expect that with vacancy rates extremely tight at 0.9% in Central, decentralisation will only continue to gather pace in 2019, regardless of the expected weakening of occupier demand. Meanwhile, optimism around retail real estate was observed to have grown in early 2018 when average high street rents inched up 0.3% QoQ in Q1 2018 after 13 consecutive quarters of decline. “That appears to be short-lived with rents contracting 0.4% QoQ most recently in Q4 2018. The trend in rents mirrors that of retail sales, which saw a sharp rebound in early 2018, but in recent months have fallen prey to downbeat sentiment on the back of house price declines and stock market volatility,” Chan and Toh noted. Tourist arrivals were strong and hit a record high of 65.1 million visitors in 2018, catapulted mostly by Mainland Chinese day-trippers. And while this lent support to discretionary spending, retail sales growth still slowed to 0.2% YoY in December. Retail leasing activity in Q4 2018 was noted to have come from healthcare and personal care retailers as well as cosmetics brands, but several leases were reportedly completed below market rents, demonstrating the challenges that still face the retail sector. Prospects for the logistics market in Hong Kong appear to be the most robust of the commercial real estate space in spite of the trade war, although this is largely due to constraints on supply. CBRE data showed that roughly 6 million sqft of warehouse space could be removed from the market over the next five years which is expected to exacerbate an already tight warehouse market. Healthy demand from third-party logistics (3PL) companies supported leasing activity, driving overall warehouse vacancy rates to a four-year low of 1.9% in Q4 2018. “Whilst leasing demand could take a hit in 2019 from slowing trade activity, a lack of new warehouse supply will result in vacancy rates remaining low, which will likely support rental growth in 2019,” Chan and Toh said.